Australia's vast, wild and untamed countryside has long acted as a magnet that encourages exploration and expeditions. For the earliest white explorers, those journeys could last a far shorter time than planned and leave a far smaller number of explorers by the end. Today, caravans, SUVs and an increasingly connected world mean the journey isn't quite as dangerous. Many spend months crossing the country and exploring its most isolated parts – and why not when subtropical rainforests, pristine coastlines and a desert interior make for a diversity of ecology that continually changes as the odometer ticks over? For Erin Skubiski and Carmel McGrath, that ever-changing landscape has been their home for the past 14 months. 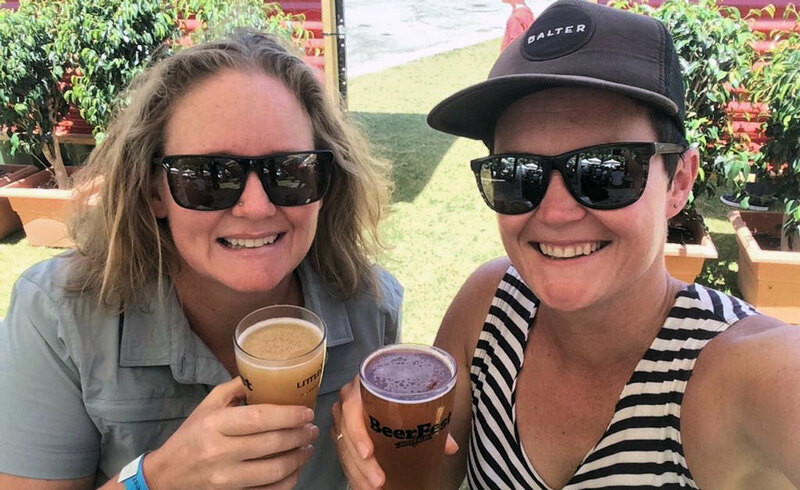 Living with their dog, Ziggy, inside their trusty Land Rover, Dunk, Erin and Carmel live the life of beer loving nomads: camping, exploring Australia and stopping into whichever breweries they desire when one crosses their path. With each brewery visit, Erin and Carmel post about the venue on their Ode to The Road blog, letting would-be travellers know about the growler situation and whether or not it's a dog friendly locale. 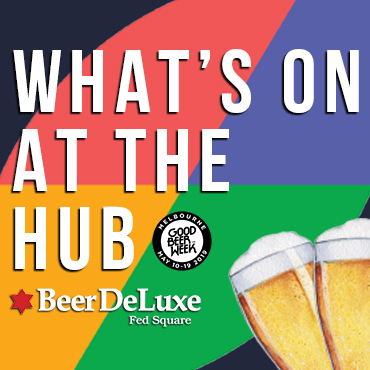 The last month has been their biggest yet beer wise, with seven breweries and three beer festivals on the menu as they made their way across Western Australia. But, with dry days on the Nullarbor ahead, it's only fair to ensure you've had your fair share of good beer before setting off. 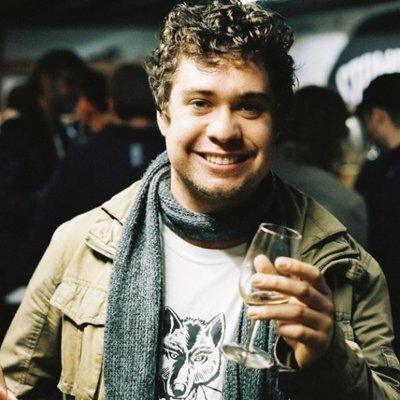 "It won't be too long before we're making our way east and across The Nullarbor, so [there] will be a drought of breweries for a bit," Erin says. "Luckily, there are plenty of good ones in Adelaide to make up for it on the other end." Erin Skubiski (left) and Carmel McGrath hanging out at BeerFest. 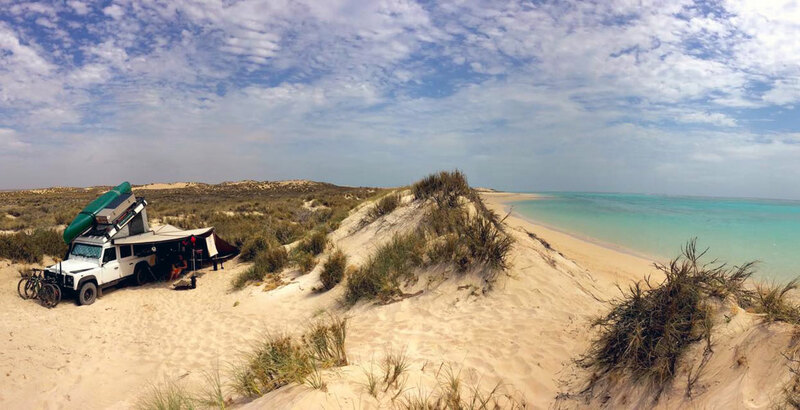 Somewhere in Oz – currently Western Australia. Probably just "lover" – we are lovers of all things beer. We’ve both always been beer drinkers, but properly got into the wonderful world of craft beer eight to nine years ago. Having The Taphouse in Darlinghurst literally as our local probably contributed. We eventually joined their Ale Stars, which was a great way to get to learn about beer and Aussie breweries. We are also member-owners of Hopsters Co-Op Brewery, Australia’s first cooperative brewery, which is pretty exciting. When we went to Europe a few years ago, we made sure to include a visit to the Czech Republic so we could spend time at a Beer Spa. It's literally bathing in beer, whilst having access to all-you-can-pour beer from taps on the side of the tub. Left: The Hopsters Co-op in Sydney. Right: The beer spa they visited in the Czech Republic. What’s the biggest detour you’ve ever taken for beer? Not necessarily a detour, as we could have easily driven there when we left camp, but this was a bit more adventurous. We paddled the canoe a couple of kilometres across Lake Jindabyne and back, during a storm, to visit Jindabyne Brewing. Ziggy, our brewery-loving dog, was not overly impressed on that occasion. Erin uses Untappd, but only started at GABS 2017, so a lot went undocumented before that. We both love a good sour, one that makes you really pucker. So Social Bandit’s two sours (including one brewed with Berocca) and Feral Brewing Co’s Watermelon Warhead all stand out. Captain Bligh’s Dark Ginger also blew Carmel’s mind, perfectly combining her love of dark beer and ginger beer. We have a love-hate relationship with Garage Project, as their quest to brew extreme beers creates some that are awesome, and some we find terrible. Clothing space is pretty limited on the road, but Carmel did buy a t-shirt from Froth in Exmouth. And, of course we have Hopsters tees and caps. As we travel, we only have a Hopsulator each (recent additions thanks to Christmas pressies from a mate). In storage, we have a nice little collection of various sizes and shapes of beer glasses. Is any part of your Land Rover that’s dedicated to beer? As much as we would have liked to bring our magic box and buy kegs at breweries along the way (mostly kidding), we had to settle for making space in Dunk for our trusty stainless-steel growler. What are some of the challenges keeping beer fresh and cold when traveling long distances in a hot country? How do you overcome those challenges? The biggest challenge is limited fridge space, which the beer actually has to share with food as well. To overcome this, we buy cans on the road, as they are easier to travel with, and can be crushed to take up less space until we find a recycling bin. We also use a “two-out-two-in” system, where any time beers come out of the fridge, they are replaced with new ones, so there are always some chilled. It's great when we are able to fill up the growler, as it stays cold for the rest of the day (and rarely lasts longer than that). Dog beer for Ziggy at Capital in Canberra, the all important growler (in this case from Thirsty Crow in Wagga), and pulling up outside Little Rivers in Scottsdale, Tasmania. Definitely more than 1,000, but exactly how many more, no idea… and probably best not to think about. We actually track our expenses on the road, and have averaged $114/month at breweries over the first 13 months. Takeaway beer would probably be another $150/month or so. How much longer do you plan on travelling for? Any breweries you definitely want to stop in on in the near future? We plan to travel indefinitely, only stopping when we find some where we want to settle down, or if we run out of money, haha. The brewery we are most looking forward to visiting is Hopsters. The DA has been approved for the taproom in Enmore, so we are excited to get back to Sydney for it once it's open. Erin: A strong, hoppy IPA that is dangerously easy to drink, despite its high ABV. Carmel: An espresso milk stout to die for. You can keep track of Erin and Carmel's adventures and see which breweries they've visited recently by following their Facebook page. You can read other Beer Nuts Q&As here and, if you'd like to nominate someone for a future feature, get in touch.